(Bloomberg) -- Impala Platinum Holdings Ltd. is facing some tough choices as the South African miner works to stem losses at aging shafts amid slumping prices for the metal. “There isn’t much management can do at this platinum price,” Hochreiter said. “They have been surviving on hope but it isn’t a very good strategy. Implats isn’t the only one facing difficulties, with about half of the industry’s production estimated to be unprofitable. Rival Lonmin Plc is cutting 12,600 jobs over three years and its future hinges on the speedy approval of a merger deal with Sibanye Gold Ltd. Anglo American Platinum Ltd., the top producer, is in a better position than its counterparts after exiting high-cost assets, Morgan Stanley analysts said in a note. 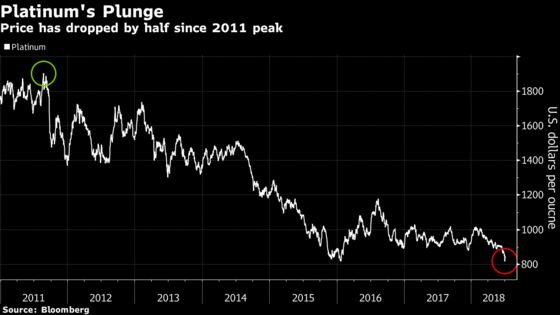 Platinum prices have dropped by more than half since a 2011 peak, as demand for the metal used to curb pollution from diesel cars weakens, partly because of slower sales of the vehicles in Europe. The sell-off in the metal has gained pace this year amid concerns that industrial demand could be curbed as trade tensions escalate. Platinum price rose 1.7 percent to $858.46 an ounce as of 11:46 a.m in London. Implats shares have dropped 34 percent this year, making it the second-worst performer on the five-member FTSE/JSE Africa Platinum Mining Index, behind Lonmin. Sibanye, which produces both gold and platinum-group metals, is down 50 percent. Implats rose 2 percent to 21.6 rand as of 12:42 p.m in Johannesburg. Implats has initiated a so-called Section 189, a labor process South African companies must complete before dismissing workers for operational reasons, Theron said. Implats shut a shaft at its Rustenburg operation in January and flagged three more to be closed once mined out. Two new shafts will together produce about 300,000 ounces a year by 2021-22 to replace higher-cost production, Theron said.